Saima and Zubair are teenagers with a severe hereditary condition characterized by muscle weakness, poor control of movement and co-ordination. They are unable to walk or speak but can communicate by other means. Both are lively and enthusiastic pupils at their special school in Hertfordshire but their disabilities prevent them from fully participating in educational activities. Some time ago DEMAND designed an articulating arm support for Zubair. This attaches to a custom made mount on his wheelchair and balances the weight of his arm, allowing him to reach and handle objects more easily. 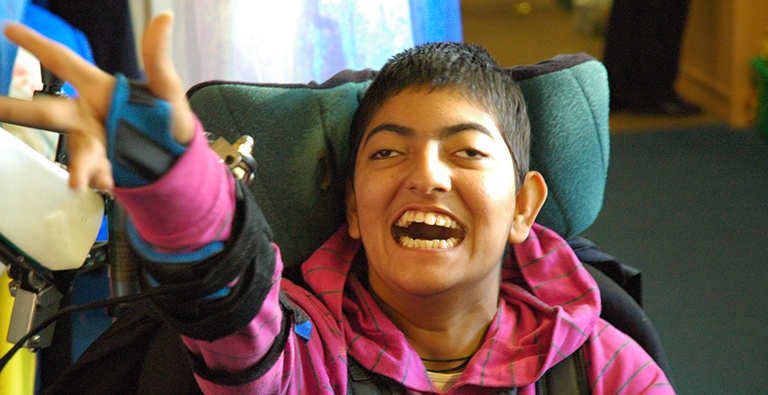 It proved to be so effective both educationally and therapeutically that the Occupational Therapist asked DEMAND to make another for Saima, who has similar needs for support. 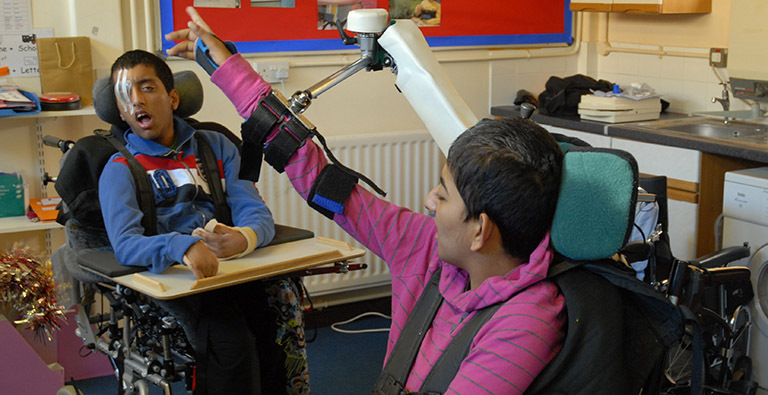 The design of Saima’s arm support benefitted from the feedback on the performance of Zubair’s support. The new support arm is much easier to fit and set up, and the lifting force can be fine tuned while the support is being used, allowing it to be adapted to suit variations in the tasks being carried out.